Last year, Lightbend released a three-day, instructor led training class entitled Lightbend Reactive Architecture - Professional. The main premise is that designing cloud-native systems and microservices requires architects and teams to think differently from the types of applications we’ve been building over the last 10-15 years. We set up the Lightbend Reactive Architecture class to teach development managers, architects, and software developers how to think about Reactive Systems, from design through to production readiness in the cloud or on-prem. How could Lightbend teach many more of the Reactive Architecture courses to meet such high demand? How could we offer an individual the flexibility of when and at what pace she/he completes the course? 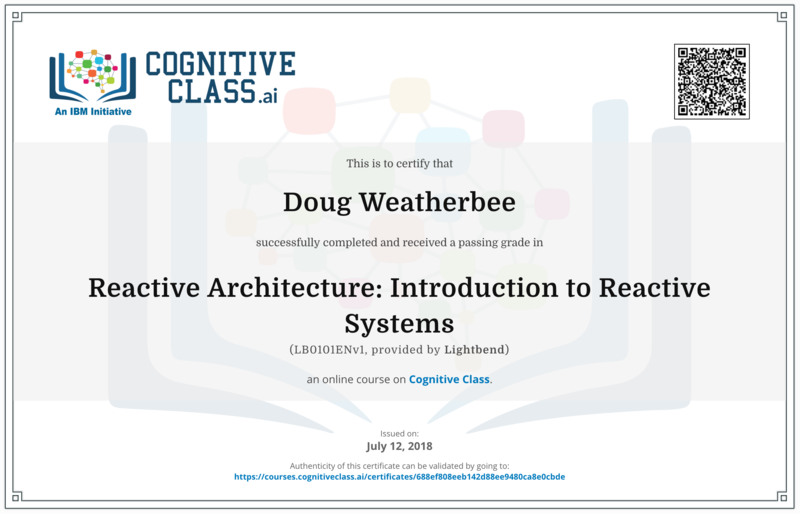 It turns out that Lightbend’s strategic alliance with IBM offered the ability to create a self-paced online version of the instructor led class available for free on IBM’s Cognitive Class online learning platform. Lightbend and IBM think Reactive Architecture principles and techniques are the best way to build modern, responsive cloud-native (or on prem that’s ready for eventual cloud deployed) systems. We believe in Reactive Architecture so much we want it shared and known as widely as possible. So Lightbend and IBM are making all six of the self-paced courses free.